How did political parties use advertising in the 2015 general election campaign? Below is an article that I wrote for Market Leader; the strategic marketing journal for business leaders. I’m reproducing the unedited version with permission of Market Leader. To subscribe to their publication visit http://www.warc.com/bookstore © Copyright Warc and The Marketing Society. Marketing commentators who scorn political advertising don’t understand how it really works, writes Benedict Pringle. The marketing industry love to pour scorn on political advertising and this general election has been no different. There have been countless articles in the trade press doing down the promotional efforts of the political parties, all featuring a version of the headline “political advertising isn’t working”. Perhaps it’s our way of rebelling against our political masters: a retort for the endless regulatory missiles aimed at our sector. Such behaviour is understandable. However the arguments proffered betray a lack of understanding about why and how political parties use advertising. Political advertising does not begin and end with the billboard – though they are great fun – and the primary objective is very often not ‘influence undecided voters in target seats’. There’s plenty of evidence to suggest that it is not “not working” and political advertising in fact made a crucial difference in the result of the 2015 UK general election. Political advertising was employed in the general election in five ways: (1) As PR stunts to steer the media narrative around the election; (2) As a tool to motivate activists; (3) A device to demotivate opposition supporters; (4) A way to interfere with the competitors’ strategies; (5) A mechanism for influencing undecided voters. The media narrative around an election – the ‘air war’ – is widely regarded to be the most significant factor in the result of the election as it colours the information that the electorate use to decide which way to vote. You win the air war by bombarding newsrooms with ideas for stories, films and photos. When journalists are scratching their heads deciding what to put on the evening news, or are lacking ideas for tomorrow morning’s headlines, a new advertisement from one of the parties is a gift. Political parties therefore use political advertisements to try and build their election narrative through the media. The Conservative Party very successfully used political advertisements to influence the media, particularly around the prospect of a Labour / SNP Coalition; something that wasn’t a significant topic of media discussion until the Conservatives began their advertising on the subject. 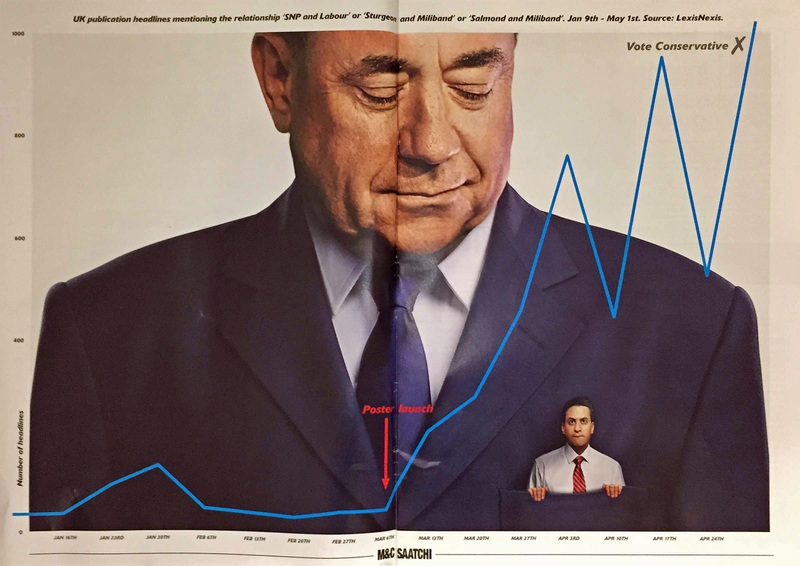 Indeed M&C Saatchi ran an advertisement in Campaign Magazine the week after polling day which demonstrated the impact on news headlines of their ‘Miliband in Salmond’s pocket’ poster. Have you ever been canvassing for a party or cause? I have. I can tell you it is, by and large, a pretty thankless task. Knocking on strangers’ doors and trying to talk to strike a reasonable, polite and hopefully persuasive conversation about politics is fairly tiresome. However political parties, particularly those with less cash to spend, are very reliant on activists to deliver their message to constituents and encourage people to head to the polls. So political parties use email, social media and their websites to distribute political advertising to their supporter base to try and inspire them to volunteer their time and energy. The Liberal Democrats, through tweeting images like the one below, weren’t hoping to win votes directly, they were hoping to get their activists to turn up to the next canvassing session. Political parties also try and encourage the supporters of their opponents to stay at home rather than go out campaign. One way of doing that is to disseminate advertising that depresses the life out of would-be activists. The Conservatives were certainly employing this tactic when they began their attacks on a possible SNP / Labour coalition. The Conservatives were very aware that for most of 2014 Scottish Labour supporters spent every free moment out campaigning against those trying to break up the United Kingdom. The Tories anticipated that Labour activists in Scotland would deeply be unimpressed that their enemies in the referendum campaign were going to be offered a seat around the Cabinet table by their own side. When the Conservatives were banging the drum about a possible pact Scottish Labour activist stocks depleted at the same time as the number of SNP supporters – buoyed by the possible prospect of government – increased dramatically. Every day of the campaign that you can divert your opponents away from their scheduled ‘grid’ is a good day and advertising is a useful tool to knock your opposition off track. That was certainly the Labour Party’s ambition with their VAT related attack. 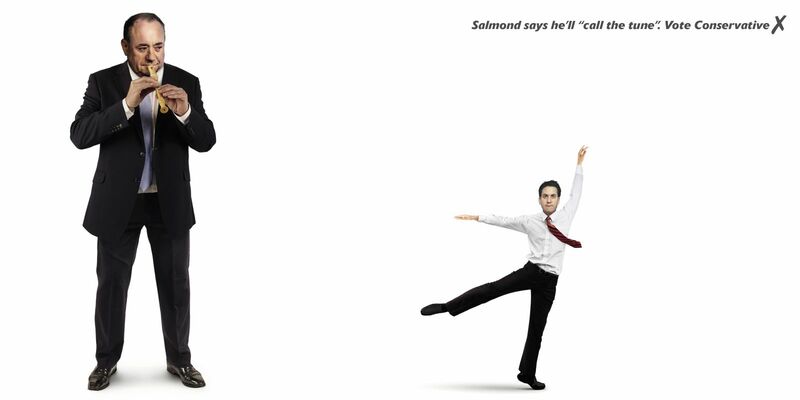 The Conservatives had made no mention of any intention to raise that tax, but the Labour Party wanted to prevent the Tories from pursuing their SNP-related agenda and so released this poster at a press conference. The way in which most political advertising is judged is the direct impact that it has on the people who decide elections: floating voters in marginal seats. The main channel through which political advertising is delivered to this audience is via direct mail. Direct mail rarely gets a mention in coverage of political campaigns, but it is the area in which the parties spend the most money. During the 2010 election, for example, the Conservatives spent £5.83million – over a third of their whole campaign budget – on direct mail. This inverse relationship between the actual importance of an election campaign technique and the amount of media coverage devoted to it is known as ‘Cowley’s Law of Campaigning’ (named after political scientist Philip Cowley who first observed the phenomenon). The Conservatives very cleverly varied the content of the direct mail depending on the seat they were targeting. For example, in villages around West Yorkshire the party led with a “Save the Greenbelt” message but in areas where UKIP was strong they focused on the choice between Miliband and Cameron to try and dissuade protests votes. The Conservatives also used YouTube pre-roll and Facebook advertising to deliver video content designed to appeal to carefully chosen demographics in the key marginal seats; this was a ‘first’ for a UK general election and is a tactic that will no doubt grow in volume and sophistication in the future. But it wasn’t just direct mail and digital video that parties used, there was also some good old fashioned posters. The Conservatives spent significant sums of money on outdoor media in the 80 marginal seats that they targeted in their “40:40” strategy which involved attacking 40 seats (particularly those held by the Lib Dems) while defending a further 40 marginals, mostly against Labour. The majority of these posters were on the subject of a possible SNP / Labour Coalition and it seems they had the desired effect; the Labour Party’s internal pollster said in his post-election analysis that the posters proved very successful at “catalyzing pre-existing doubts about Labour”. And there’s evidence to suggest that it was the Conservatives campaign tactics and spending muscle in the marginal seats that made the difference in the result; Labour’s share of the vote in England went up by 3.6 % overall but was down by 0.7% in the most important battleground seats where the Conservatives concentrated their communications activity. Political advertising is alive and working well. Previous Who is Ivan Massow?